Fog rolls up the valley from the lowlands, pushing past us in grey whisps as as we pack our bags and set off. Beyond, in the distant blue sky, sunlight glows off a mountain. The peak’s rock and snow become a beacon, drawing us forward, guiding us out of the fog and high into the mountains. The jagged peaks and sharp walls compress civilization, squeezing it into a narrow band along the valley floor. Roads, rails, houses, farms, and electric lines all crowd together, weaving in and out, jostling for space as the valley rises. Fritz reads it all like a history book as we climb, his eyes bright and full of life as he points to little things that would slip by my eye unnoticed. A set of numbers across the valley from a hut are targets for marksmen to practice their aim. Stone walls that terrace the earth to flatten the land for cattle grazing. Rock barriers built to channel the spring flood from melting snow. The covered roofs hiding the highway below avalanche prone slopes. Old military bunkers from World War II built into the mountains to guard the pass. The railroad tracks disappearing through rock tunnels that spiral up inside the mountains to reappear far above where they started. “You see the church in Wassen three times from the train,” he tells me. His words breathe life into the valley, into civilization’s endless war to survive in the mountains. The snow, the rock, the water, the cold, the freezing ice, it is all present in the design, in the decisions, in the placement of every building, road, and rail. Man has been here a long time, fighting, clawing out an existence. We walk over the Devil’s bridge, part of an old road, a miracle of stonework and engineering so astonishing that people swore the devil made it. 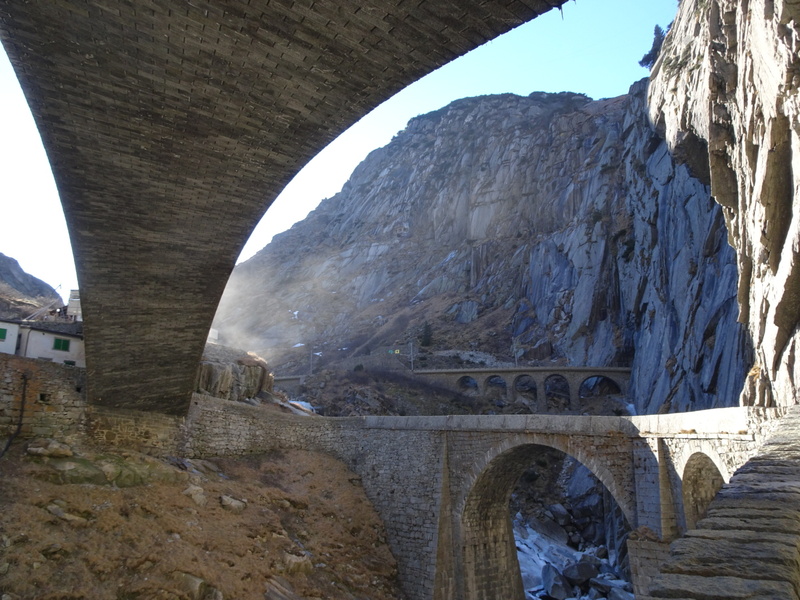 Once completed, the bridge opened up the sparsely-used route to Gotthard Pass and made it one of the most traveled in the Alps. A trickle of people and goods turned into a flood. Villages and towns thrived on the commerce, life flowed through the pass, but mountains are relentless and, piece by piece, civilization decided it was not worth the struggle and faded back. The railroad splits away first, a new tunnel, the longest in the world, cuts under the mountains for thirty-five miles to avoid the pass. The old tunnel breaks away later, leaving the rail line to Andermatt nearly empty of all but tourists heading to the resort. The highway drops away too, cutting under the mountains with cars rushing over pavement, leaving only the old road to continue up, a single, curving lane in each direction. You can see the fade of civilization in the villages, the way they’ve begun to crumble as traffic disappears. The world is too fast now, too focused on the destination. They used to be the only way across, traveling village to village, piece by piece, but gasoline engines don’t need to rest and the tunnels siphon away the cars. Now the small clusters of civilization are almost an afterthought, slowly forgotten, left to wither. By the evening we reach Hospental, the last village before the pass. The old road continues up, but it’s closed now. It won’t open until winter fades and summer draws close to melt the snow. Fritz and I walk to the edge of the village in the twilight. The mountains are all around us, fading away into the dark. The first stars flicker into existence. It’s quiet here, near the end of civilization, with the rail lines and highways gone. I look up at the pavement rising back and forth toward the pass in the darkness. I wonder where the black asphalt will disappear under white snow. Somewhere up there, I think, the road is all but gone, abandoned by the civilized world, reclaimed reclaimed by winter. We stand for minute, Fritz and I, talking about the day, thinking about tomorrow, staring back at the town, at Andermatt in the distance, at the roads and rails stretching back. Civilization is almost behind us now, or far underneath us in the rock, but not in front, not for that one inch of map. I’ve stared at that inch for months and wondered what would be there, if I could cross, if winter left a crack in the wall. I’ve wondered and wondered and wondered until I could barely sleep. Tomorrow, I will no longer wonder. Posted in Europe North to SouthTagged backpacking, ENS, Europe North to South, featured, Gotthard Pass, hiking, thru-hiking, winterBookmark the permalink. Loved the description of the tug of war between mountains and civilization. Very appropriate. Ultimately we are all part of this “amazing universe” and we can only rearrange the furniture — some good and some bad. Thank you Daniel and Fritz for such wonderful history and details in one very interesting photo! The stone constructed bridges are truly amazing. Thanks for sharing your adventure in the Alps! Thank you for this wonderful and detailed description of all that is there and has been in this fascinating approach to the pass. I am so grateful to know Fritz is there to inform you and accompany you, and that the forces that be have graced you with the opportunity to go through at this time of year. Blessings Be!